Gravelly Lake is located in Lakewood, offering an urban oasis in the city for those who own Gravelly Lake waterfront real estate. 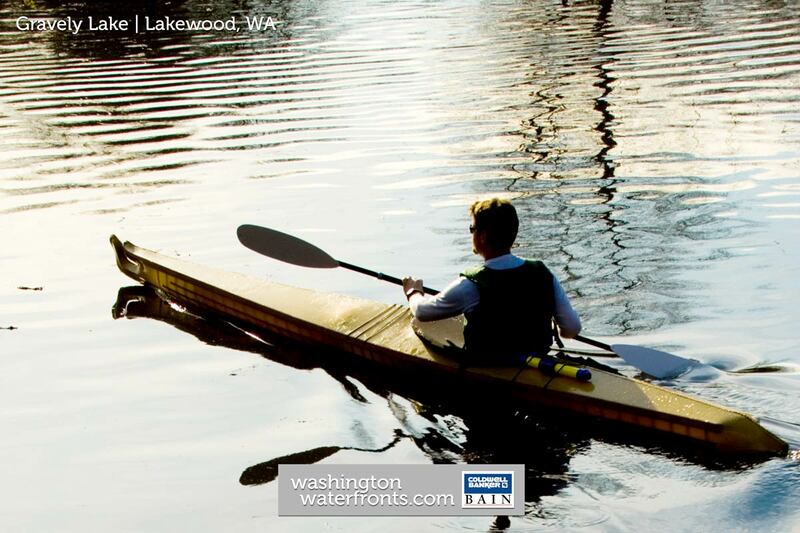 Named for its gravel-covered lake bed, it’s fed entirely by groundwater and surrounded by a community of high-priced homes as the most prestigious of the three main lakes and lakefront communities in Lakewood. Ideally situated less than 12 miles south of Tacoma and just over 20 miles north of Olympia, residents can enjoy a relatively easy commute along with plenty of big-city amenities nearby while coming home to a tranquil lakeside environment. As a private, resident-access only lake, you’ll be able to enjoy fishing, floating, swimming and boating without the crowds typically seen on other area lakes. As operating watercraft over 5 mph between sunset and sunrise is unlawful, it helps maintain a more tranquil atmosphere too. While you’ll be able to enjoy lots of activities right from your door with Gravelly Lake waterfront real estate, as well as an environment conducive for relaxing and unwinding, you’ll find lots to do nearby as well. The Lakewood/Tacoma area is filled with golf courses, and the Tacoma Country & Golf Club is just a 5-minute drive away. It offers year-round recreation to its members, including a traditional 18-hole golf course with no tee times, a swimming pool, fitness classes, tennis and both casual and fine dining. A wide range of dining, shopping, entertainment and other services can easily be accessed within minutes of Gravelly Lake as well. Gravelly Lake waterfront real estate includes some magnificent properties, some with a long, private gated drive that leads an ideal lakeside retreat with stairs that lead to the lake and a dock. Others boast perks like lush landscaped grounds, a swimming pool and a hot tub. Take advantage of our industry-leading tools to make your property search as easy as possible and be sure to register for a FREE account so that you can receive email alerts whenever new Gravelly Lake waterfront real estate for sale hits the market. If you're seeking to sell your Gravelly Lake waterfront property, contact our Waterfront Specialists directly for a comprehensive listing analysis and to learn more about the cutting-edge marketing strategies we'll use to sell your home quickly for top dollar!